High performance cables for use over a long distance at high data rates for RS232 applications. They are also suitable to industrial measurement where low signal distortion is needed. 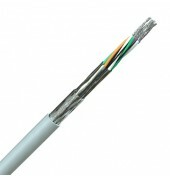 Tinned copper conductor 22(7) AWG (0.35mm2), semi rigid PVC insulation, Cores laid up, overall. Aluminium/polyester foil screen, tinned copper drain wire (24AWG), overall tinned copper braid (65%). PVC sheath.